These two very rare and intriguing flags from the Rare Flags collection are juxtaposed to represent the diametrically opposed principals of abolitionists and secessionists, embodied in the form of the American flag of their common heritage. At the outbreak of the Civil War, our 34 states were split between 19 free states and 15 slave states. With South Carolina declaring secession in December 1860, and the first shots fired on Fort Sumter in January, 1861, the national fabric began to unravel as a series of southern states followed South Carolina and joined to form the Confederacy. Not until the final decisions were made by the four slave-holding border states of Maryland, Delaware, Kentucky and Missouri in the late spring of 1861 (all of which ultimately remained a part of the Union) were the territorial lines established between the Union and the Confederacy. In the North, passionate Abolitionists sought to separate their national identity from the slave-holding states and in the South, passionate Secessionists sought to separate themselves from the free states. 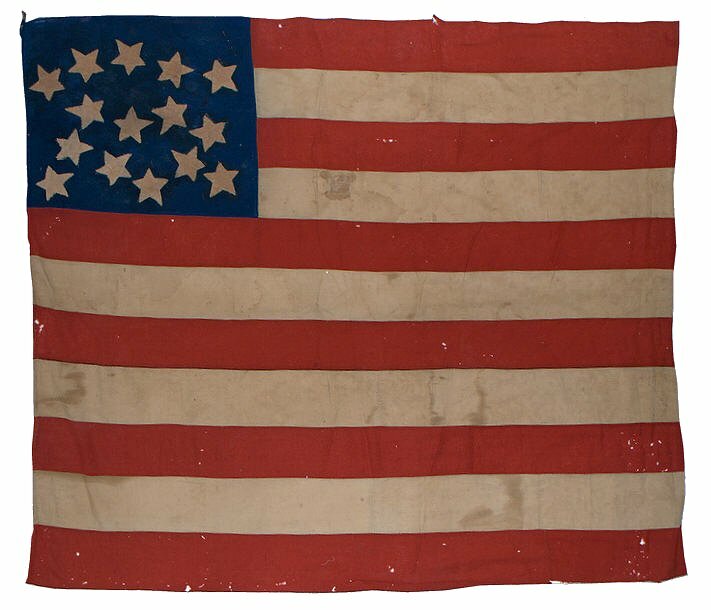 On the Abolitionist Flag, IAS-00400, we find 19 stars, representing the 19 free states, and 7 stripes, representing the original 7 free colonies of the United States (excluding, from the original 13 colonies, Delaware, Maryland, Virginia, South Carolina, North Carolina and Georgia). On the Secessionist Flag, IAS-00239, we find 15 stars, representing the 15 slave states, and 11 stripes, representing the original 11 states of the Confederacy. Despite dating from the same era, and being of the same form of our cherished Stars and Stripes, they could not be more symbolically different in the ideas they embody. One could only imagine what a fierce debate would have erupted between the two makers of these flags, should they have met each other face to face. The term "exclusionary flag", in which stars on the American flag are intentionally withheld from the flag's design due to political differences, applies equally to both of these flags. "The other night when somebody was charging upon the party in power that in 1856 and 1860 they manifested themselves as opposed to the flag of their country by striking there from fifteen of its stars, making it purely sectional, thus showing their disposition to dissolve this Union--when the charge was made, members in their seats responded that it not true. Now, sir, I know from my own certain knowledge that in my own county in 1856 there was not to be seen a campaign flag carried by the Fremont party with more sixteen stars upon it--not one; and when they had an old flag in which they could not get rid of the obnoxious stars they took black or ink and spotted them out. Besides that, every map of the country which was circulated by that party during that campaign exhibited the southern portion of country the blotted out. All the States south of Mason's and Dixon's line were blotted out being a sort of a Sahara where slavery was tolerate, where flourished those "border ruffians" who were attempting to force slavery upon the people of Kansas." One of the best sources describing flags presented by southern Secessionists during the formulation of the flag of the Confederacy is the account of the proceedings of the Committee on the Flag and Seal of the Confederacy, described below in this passage from the Origin and Progress of the Flag of the United States by Admiral Henry Preble. "While a committee had the matter of a permanent government under consideration, the convention discussed the subject of a national flag. Various devices were presented. The designers, in many instances, were patriotic ladies, and many of these designs were but modifications of the grand old stars and stripes. On the 9th of February, Mr. Memminger presented to the convention a flag sent by the young ladies of Charleston, S. C, as a model flag for the Confederate States ; the device was a blue cross on a red field, with six white five-pointed stars or mullets blazoned on the cross. At the same time he presented another, from a gentleman, which had fifteen stars within a cross, but the cross upon a different ground. 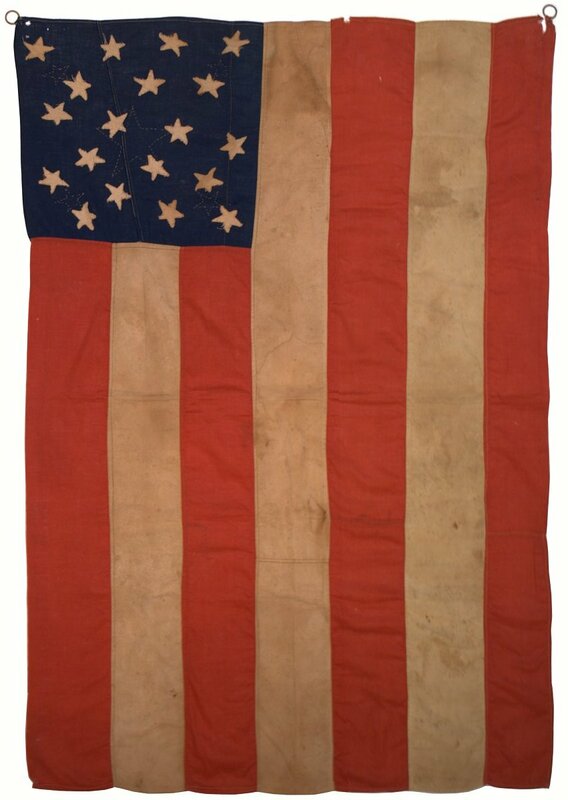 On presenting these flags, Mr. Memminger said: "Mr. President, the idea of union, no doubt, was suggested to the imagination of the young ladies by the beauteous constellation of the Southern Cross, which the great Creator has placed in the southern heavens, by way of compensation for the glorious constellation at the north pole. The imagination of the young ladies was, no doubt, inspired by the genius of Dante and the scientific skill of Humboldt. But, sir, I have no doubt that there was another idea associated with it in the minds of the young ladies,—a religious one,—and although we have not seen in the heavens the "In hoc signo vinces" written upon the laburnum of Constantine, yet the same sign has been manifested to us upon the tablets of the earth; for we all know that it has been by the aid of revealed religion that we have achieved over fanaticism the victory which we this day witness; and it is becoming, on this occasion, that the debt of the South to the cross should be thus recognized. I have also, Mr. President, a commission from a gentleman of taste and skill in the city of Charleston, who offers another model, which embraces the same idea of a cross, but upon a different ground. The gentleman who offers this model appears to be more hopeful than the young ladies. They offer one with seven stars,—six for the States already represented in this Congress, and the seventh for Texas, whose deputies we hope will soon be on their way to join us. He offers a flag which embraces the whole fifteen States. God grant that his hope may soon be realized, and that we may soon welcome their stars to the glorious constellation of Southern confederacy." These remarks were applauded, and a committee of one delegate from each State was appointed to report a device for a national flag and seal. Mr. Brooke, of Mississippi, offered a resolution to instruct the committee to report a design for a flag as similar as possible to that of the United States, making only such changes as should give them distinction. In his speech he spoke of the associations which clustered around the old ensign,—associations which could never be effaced. "Sir," he said, "let us preserve it as far as we can; let us continue to hallow it in our memory, and still pray that ' Long may it wave O'er the land of the free and the home of the brave.' " His eulogy of the old flag was so full of Union sentiment that it was regarded as treasonable, and Brooke was severely rebuked. William Porcher Miles, of South Carolina, the chairman of the committee, protested against the resolution and the utterance of the mover. He gloried more, a thousand times, in the palmetto flag of his State. He had regarded, " from his youth, the stars and stripes as the emblem of oppression and tyranny." He was so warmly applauded that Brooke, at the suggestion of a friend, withdrew his motion.